1,312 Carson Scholars from the Pennsylvania-Ohio area. Neeloy is an 11th grade student from Pittsburgh Science & Technology Academy in Pittsburgh, PA. Neeloy is a member of the Robotics Team, the National Honor Society, the Math League Team and is an SciTech Ambassador for Magnet School Program. 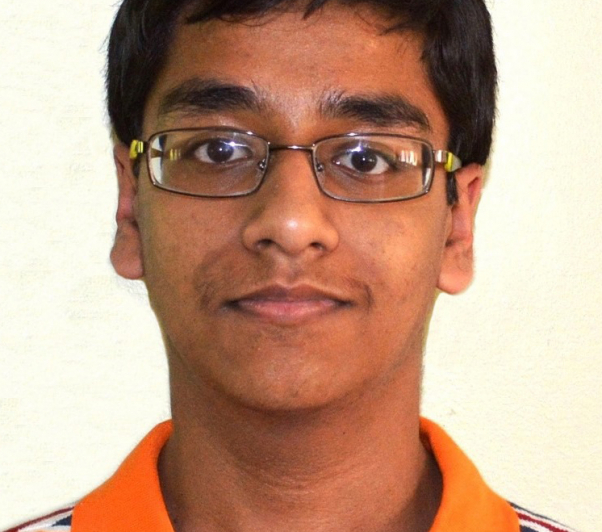 He enjoys computer science and engineering because he loves solving read world problems, scaled down, with simple solutions. He received a Carnegie Library Labsy Participation Award and a STEM Computer Science Award. He serves as a mentor for Hour of Code and volunteers for the Susan G. Komen Race for the Cure event every year. He enjoys hosting the Bengali Association of Pittsburgh Cultural Program and teaching younger children how to play soccer. View photos from the 2018 Pittsburgh Carson Scholars Charity Golf Tournament. View photos from the 2018 Pittsburgh Awards Banquet. View photos from the 2017 Pittsburgh Awards Banquet. Our friends in Pittsburgh are doing a double take. After 11 successful years of fundraising, the Pittsburgh Chapter has transitioned to a new way of providing scholarships to local students and it’s twice as nice. This year, the Pittsburgh Chapter doubled down and executed two events in one day. These two events were a wonderful success thanks to the hardworking golf and dinner committee: Thomas and Fran Donahue, Robert and Rosemarie Schuler, Gerald and Patti Loyacona, and Richard and Mary Krauland. This doubleheader began with a golf tournament at Laurel Valley Country Club in Ligonier, PA. Thirty-two golfers including CSF Co-founder Dr. Ben Carson arrived at Arnold Palmer’s home course to show off their skills and have some fun. Competition was tough, so golfers had to work twice as hard to come out on top. The Pittsburgh Chapter was double booked for the day. The conclusion of a successful golf tournament led to the beginning of an exclusive dinner event at the Duquesne Club in Pittsburgh, PA. The evening began with a spectacular silent auction consisting of a wide array of items such as original artwork, tickets to a Pittsburgh Penguins hockey game and a diamond necklace donated by Chapel Hill Jewelers. Guests were able to place bids on various items and mingle while listening to a live piano performance. Candy Carson didn’t have to think twice, she welcomed the guests to the special evening to benefit high-performing young students. After enjoying a soothing violin performance during dinner, Dr. Ben Carson was introduced by President of the Pittsburgh Chapter, Fran Donahue. Dr. Ben Carson delivered an inspiring keynote speech on education and the importance of a “THINK BIG” mentality. Thank you to all who attended to support students in Pittsburgh and the surrounding areas. Click here to view a video from the golf tournament, as well as photos from the golf tournament and the exclusive dinner event. On Thursday, December 3 the Pittsburgh chapter of the Carson Scholars Fund hosted their 12th annual charity auction and cocktail event at The Andy Warhol Museum in downtown Pittsburgh. 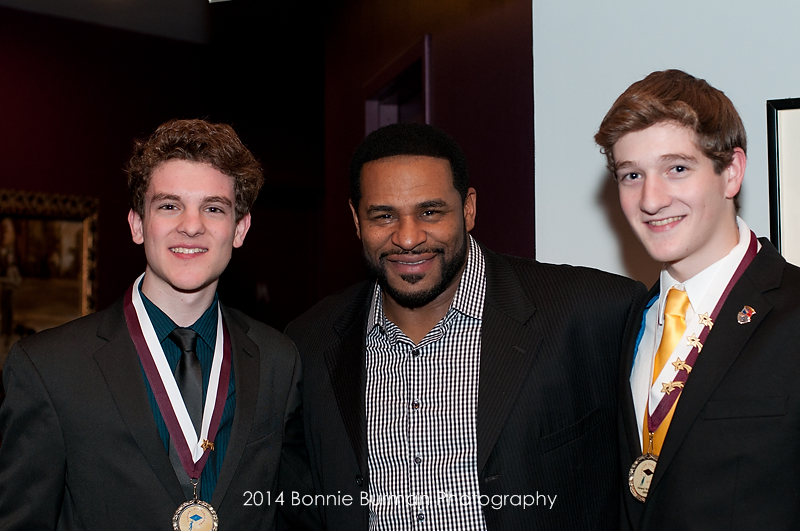 Jerome Bettis, 2015 Hall of Fame Member, former Pittsburgh Steeler and longtime supporter of CSF, along with Dr. Alfonso Costa, president of the Pittsburgh CSF chapter, hosted the evening’s events. Read more. With the Pirates playing the New York Mets and the Carson Scholars Fund’s (CSF) 11th Annual Pittsburgh Banquet, Heinz Field was teeming (pun intended) with excitement. The regal routine of entering through the club entrance, taking the special elevators to the second floor lounge and exiting into a world of starry wonder made all the celebrants of academic excellence feel welcome. The newest stars on the horizon were of course the Carson Scholars and to emphasize the point, 20-inch balloons in gold, red and blue hues hovered above many of the tables. Each balloon had four smaller well-rounded gold ones just below the star, representative of the parents, educators, families and mentors who support the academic superstars! Read more. 80 degrees and sunny! What a fabulous day to do fabulous things and on the fabulous occasion of the landmark TENTH Scholar Awards Ceremony for the Pittsburgh Chapter of the Carson Scholars Fund! 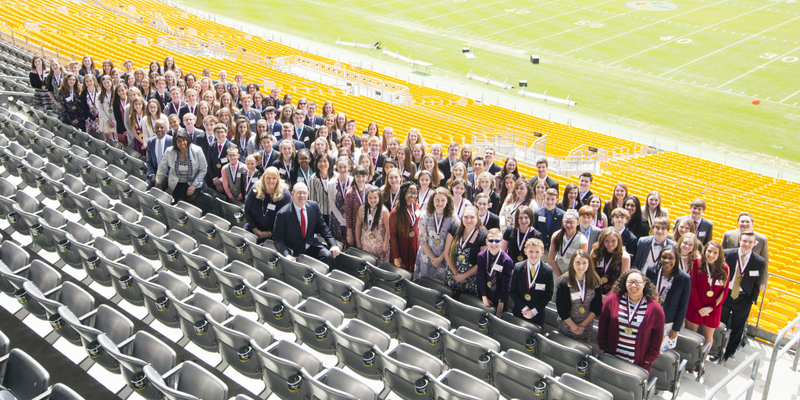 In the hall of the East Club Lounge area of Heinz Field, home of the Pittsburgh Steelers Football Team, the 91 new scholars and 152 repeat scholars from Ohio and Pennsylvania marched in to the triumphant musical fanfare. Read more. Congratulations to Jerome Bettis, former Pittsburgh Steelers running back, on being elected into the Pro Football Hall of Fame on Saturday, January, 31, 2015! Bettis is a CSF Honorary and Pittsburgh Chapter Board Member. Read more. Dr. Carson and his wife, Candy, celebrated Pittsburgh area Carson Scholars during a scholarship ceremony at Heinz Field on April 17. Urvi Gupta and Sarah Johanknecht, both students at Seneca Valley High School, were named as 2016 Carson Scholars by the Pittsburgh Chapter of the Carson Scholars Fund. Seneca Valley School District is honoring two students in the Pittsburgh area who have been named 2016 Carson Scholars.